For security reasons, never leave your baggage unattended at any time. 1hour 15 minutes, is the time necessary to avoid of danger from a suspect baggage. The terminal can be closed and flights cancelled for this reason . Each airline specifies quite clearly the items prohibited for hand and hold luggage and tips to better prepare your suitcase. If you do not respect the airline’s luggage instructions you are liable to pay additional fees imposed by your airline at the airport. Note that all prohibited items will be confiscated and destroyed by airport security officers. In most cases all passengers above 2 years of age may carry one piece of hand luggage during their flight. Hand luggage sizes may vary depending in the airline. Note that a handbag and a camera may be considered as a piece of hand luggage for certain airlines. Only bring what is absolutely necessary in your cabin luggage for your flight on board and do not forget to check hand luggage contents comply with airport security rules to avoid confiscation. To date there are no lockers or storage facilities at the airport to leave your articles that risk confiscation. 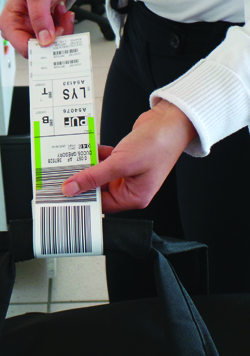 Your luggage will be labelled during check-in. However, you can also label your luggage with your name and address, which is always helpful in case of loss. Some airlines may allow the checking in of certain items such as bicycles, golf clubs, surfboards, etc., but it is necessary to verify beforehand with your airline. Baggage handling disputes differ between airlines. If you do not retrieve your luggage when you arrive at Caen Carpiquet airport or is damaged, you are kindly asked to proceed to the airport Ticket Sales desk to let us know. Please have your boarding pass stub ready to present to ground handling staff.